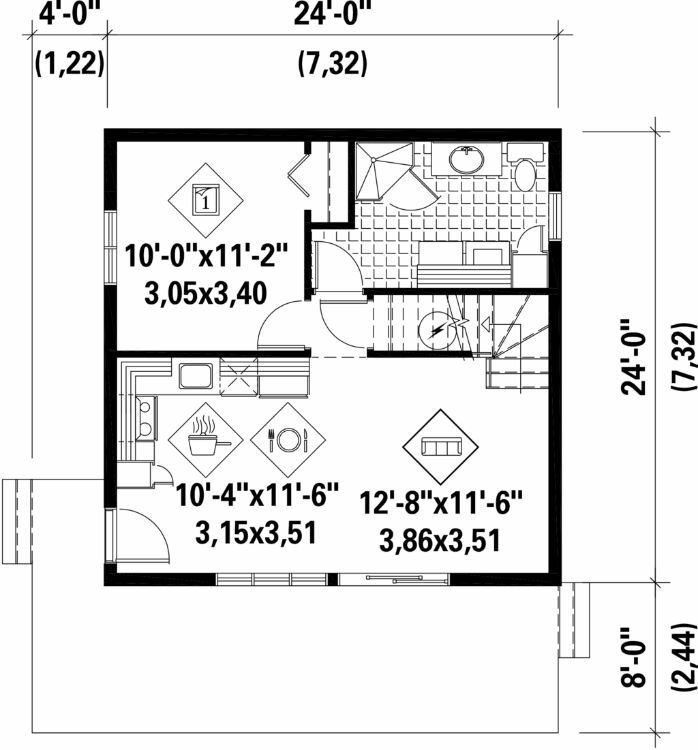 This style of kitchen takes up a bit more space than some other kitchen layouts, but as the following plans show, it's still possible to have one if you live in a tiny home. 1. 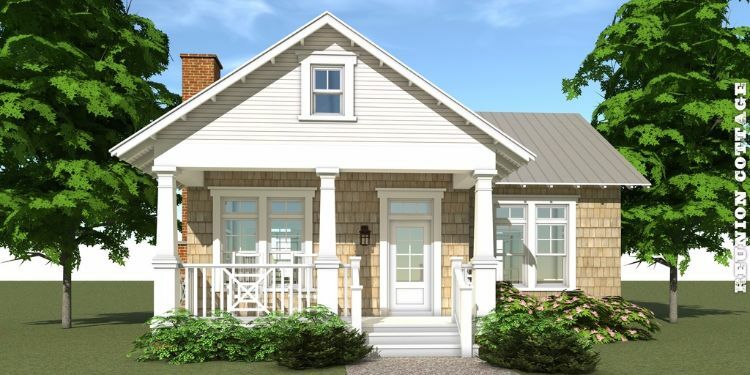 Charming country bungalow from Houseplans. Despite being only 841 square feet (78 square meters), this design from Houseplans has plenty of closet space and more than its fair share of curb appeal. A small foyer welcomes you into the home, and you can head to either the living room on the left or the bedroom on the right. From the living room, you can pass through an archway to enter the formal dining room, where a set of sliding doors lead out to the back porch. Pass through another arch on the right, and you'll find yourself in the kitchen. The bathroom boasts both a tub and a shower, but it can only be accessed through the bedroom. 2. 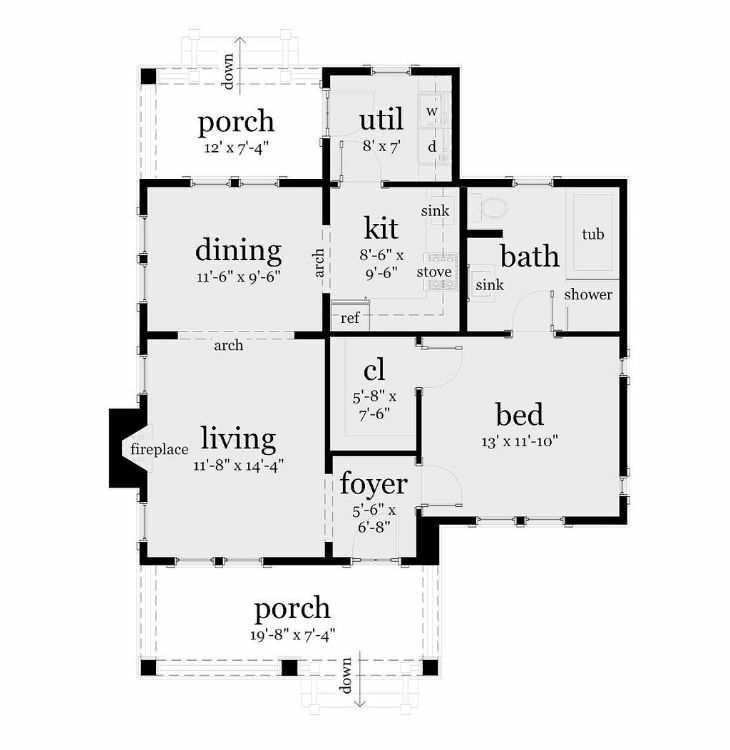 Tiny two story home from ePlans. 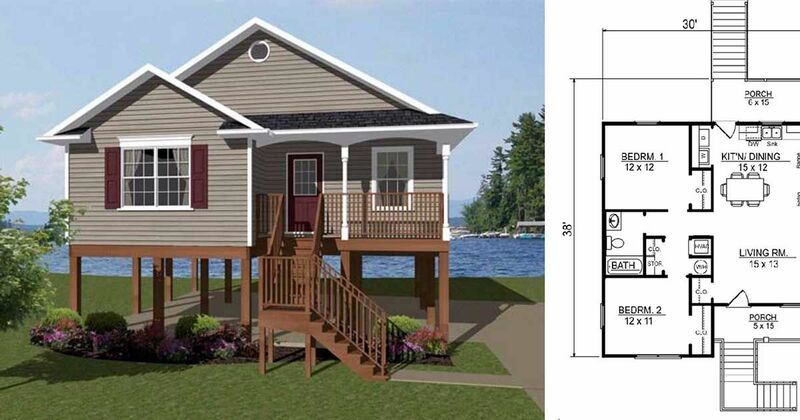 This lovely little home from ePlans is two stories tall, but it comes in at only 484 square feet (45 square meters). The front door opens right into the open concept kitchen and living room, behind which are the bedroom and the bathroom. The bonus room upstairs takes advantage of the space behind the dormer window and would make an excellent second bedroom or children's playroom. 3. 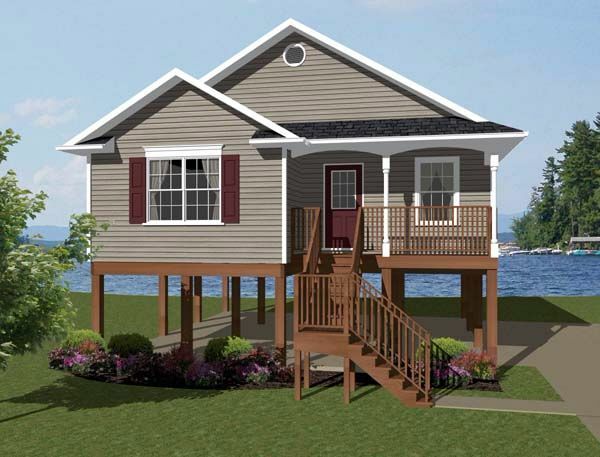 Coastal home with post foundation from Family Home Plans. 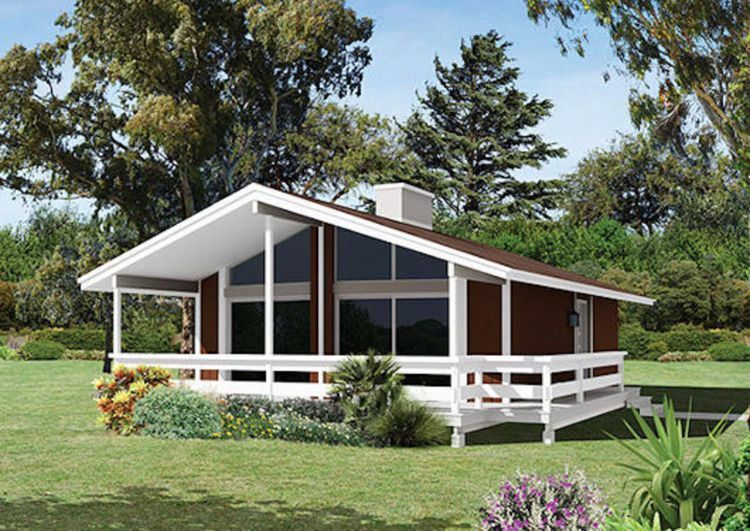 This design from Family Home Plans comes in at 856 square feet (80 square meters), and would look right at home on the beach! A flight of stairs leads up to the front porch, where the door opens directly into the living room. 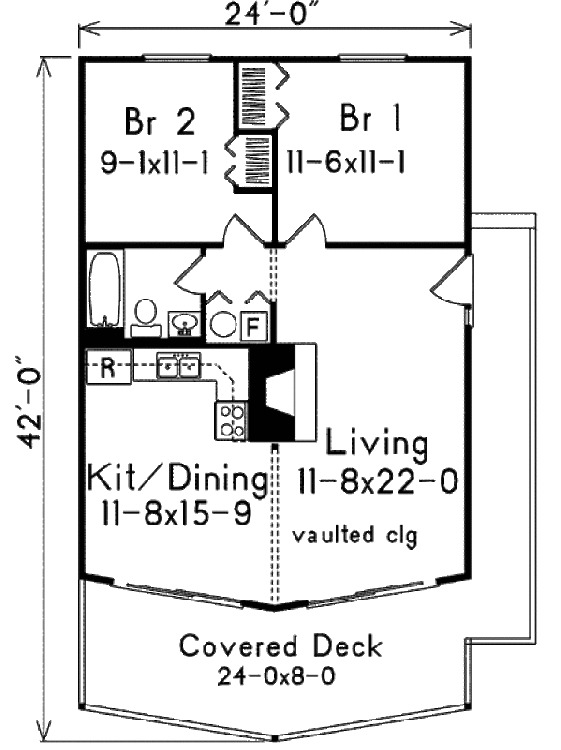 The eat-in kitchen is located directly behind the living room, and it provides access to a second small porch. 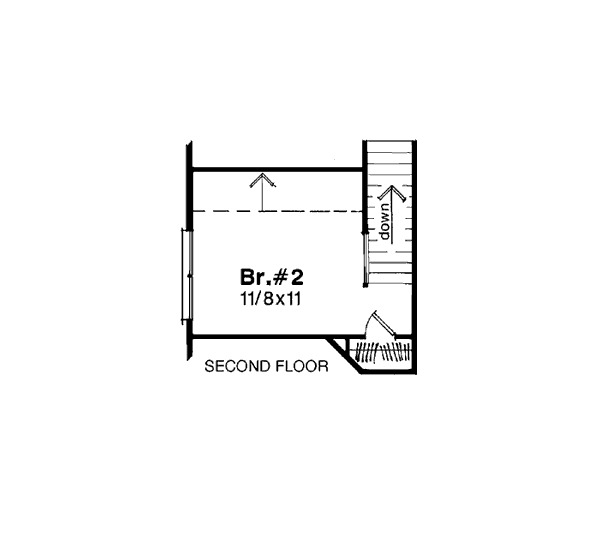 Two bedrooms and a bathroom can be found on the left-hand side of the home; one bedroom must be entered by passing through a small storage area that also contains the laundry machines. 4. Cabin perfect for a lot with a view from Houseplans. Measuring 92 square feet (74 square meters), this design from Houseplans features large windows that mean it would be perfectly suited for a lot with a view. In order to accommodate the large windows at the front, the home must be entered through a door on the right-hand side. The main living area of the home features vaulted ceilings as well as an excellent view from the windows, and the living room also boasts a large fireplace. Two bedrooms and a bathroom are located at the back of the home. 5. 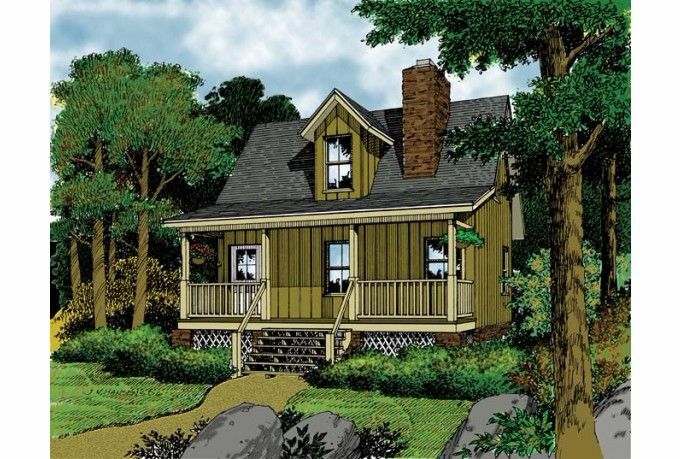 Simple country home from Family Home Plans. 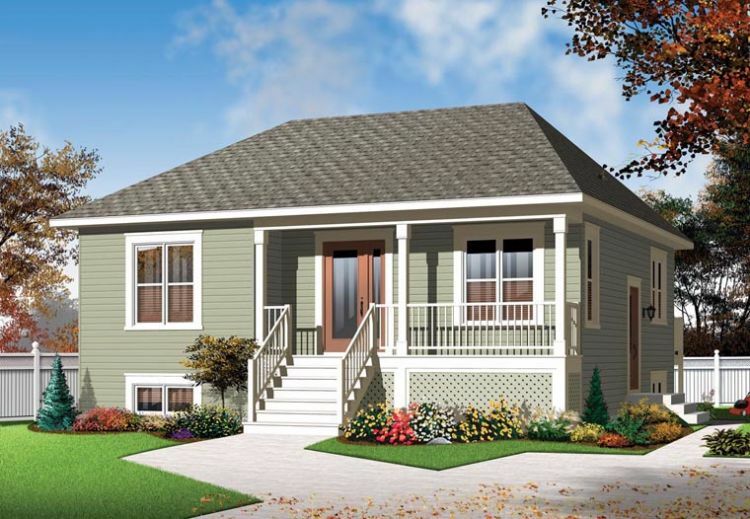 This 973 square foot (90 square meters) house from Family Home Plans looks simple from the outside, but the interior layout is surprisingly efficient. 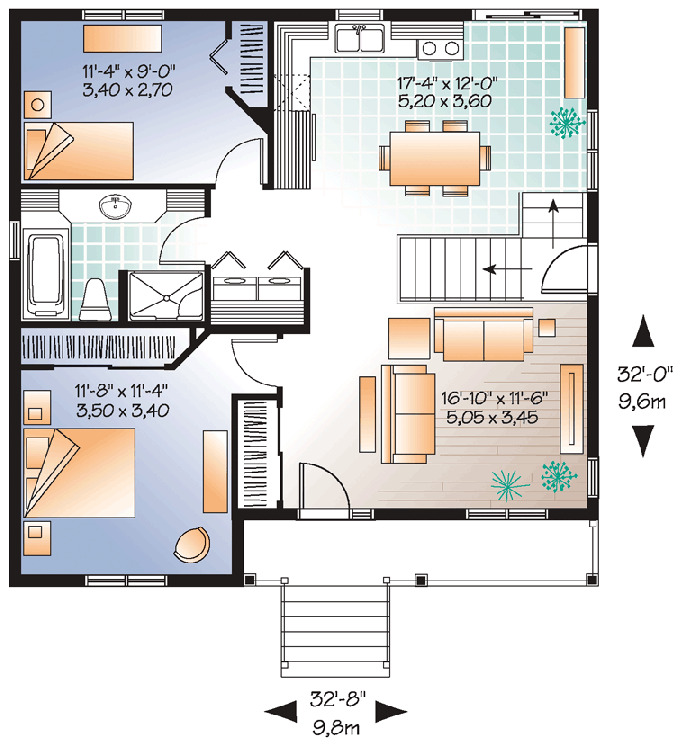 The front door opens directly into the living room, and a coat closet is just off to the left. Pass by the staircase leading to an unfinished basement to access the eat-in kitchen, where sliding glass doors lead out to the backyard. 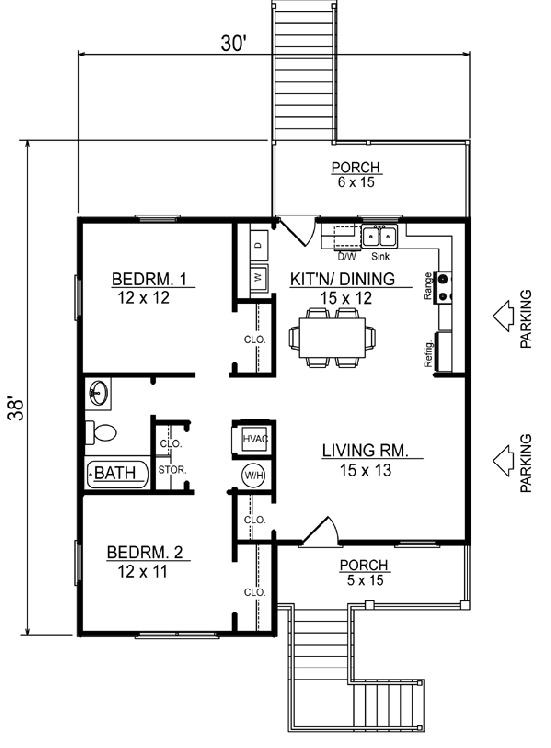 Two bedrooms are located on the left-hand side of the home; they share access to a bathroom with a tub. 6. 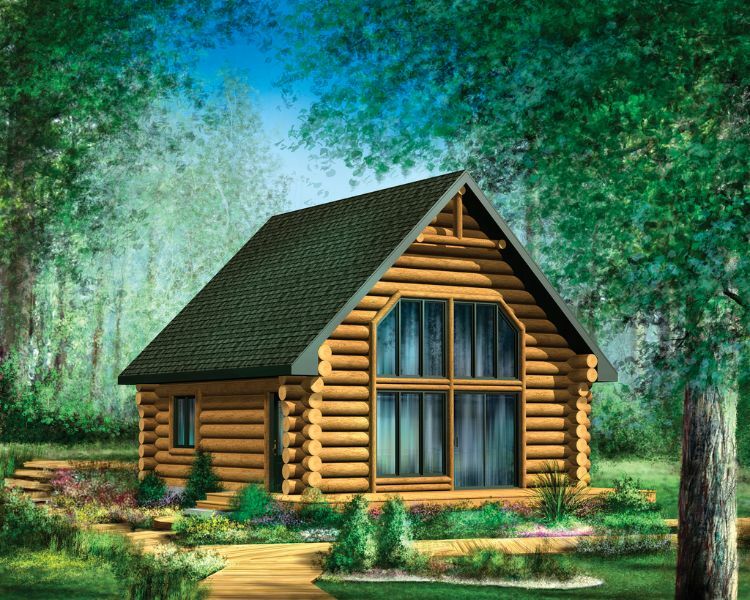 Rustic log cabin from Houseplans. At 743 square feet (69 square meters), this home from Houseplans is beautifully rustic. The front portion of the home boasts an open concept layout, and huge floor-to-ceiling windows fill the space with natural light. The living room is off to the right, and the L-shaped kitchen on the left-hand side right by the front door. The bedroom is located behind the kitchen, while a bathroom with a large shower can be found behind the living room area. 7. 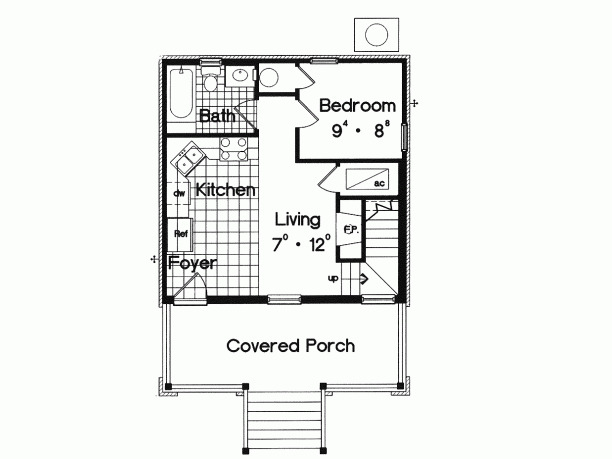 Cozy two bedroom cabin from Family Home Plans. 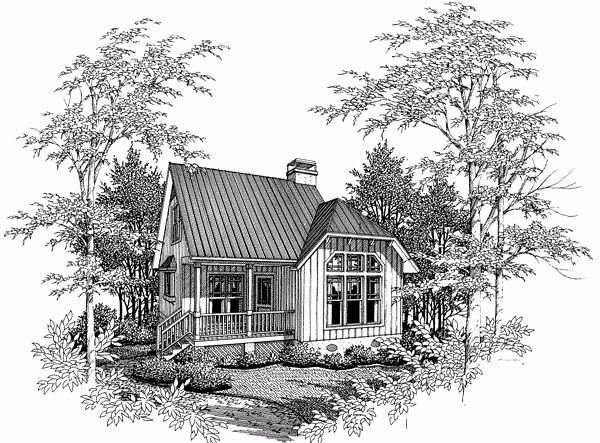 This charming little cabin from Family Home Plans measures 828 square feet (77 square meters) and can be entered through either the front door or the back door. 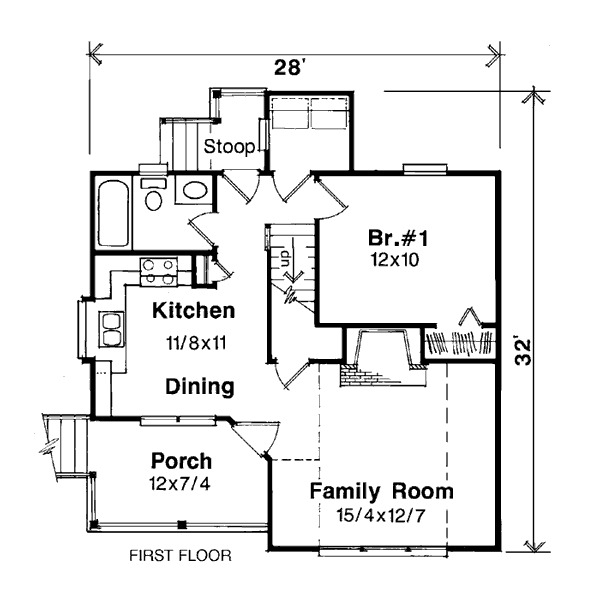 A large family room takes up the front right corner of the home, and the eat-in kitchen is off to the left. 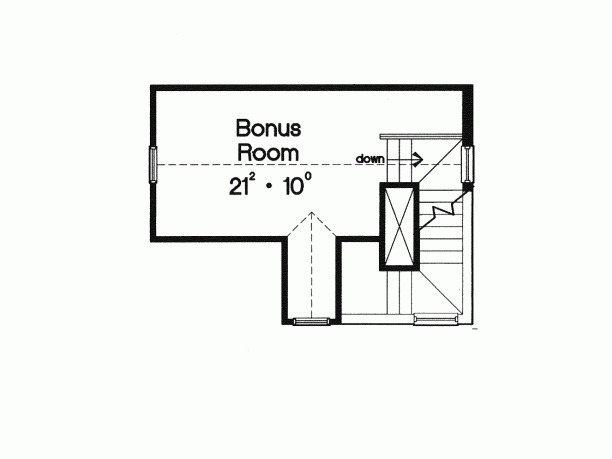 The small hallway off the kitchen leads to a bathroom with a tub, a bedroom, and the laundry closet. A second bedroom is found upstairs.